This fabulous apartment is set over 2,000 sq ft and arranged over three floors of entertaining and living space. 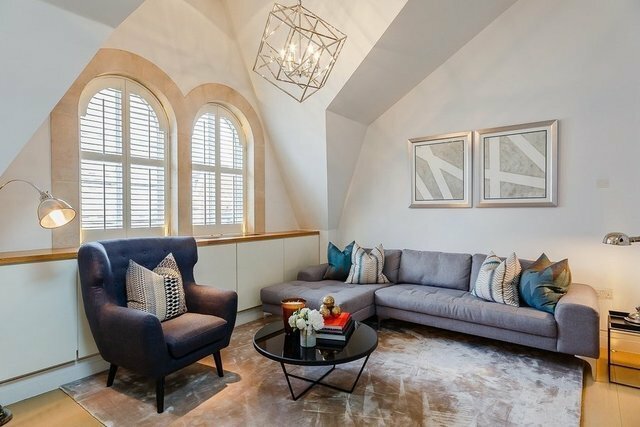 This magnificent Manhattan loft style three-bedroom apartment is situated within a prime and exclusive address in Mayfair. Third floor: Three double bedrooms with en-suite bathrooms with bay windows and a utility cupboard. Fourth floor: A spacious modern fitted kitchen with Gatineau appliances, semi open plan reception room with a contemporary double-sided glass fire place leading onto a dining room with feature arched windows with ornate wooden shutters and guest cloakroom. Fifth floor: This sky light mezzanine level can be used as an office with access via Bi fold doors onto a private roof terrace with stunning views over central London. The contemporary style is spectacular: featuring glass panelling in the hallway and a modern open staircase with contemporary glass balustrade which allows for an abundance of natural light to enter the apartment. Further benefits include an internal lift service to each floor of the apartment, a storage cupboard located in the lower ground floor of the building. There is a porter on site and the apartment is extremely safe with 24-hour CCTV. Green Street is in the heart of Mayfair, close to local amenities such as shops, restaurants and transport links.